This striking new image, taken with the powerful HAWK-I infrared camera on ESO’s Very Large Telescope at Paranal Observatory in Chile, shows NGC 1365. This beautiful barred spiral galaxy is part of the Fornax cluster of galaxies, and lies about 60 million light-years from Earth. A beautiful spiralgalaxy 60 million light-years from Earth could help astronomers betterunderstand our own Milky Way because of a trademark central bar-like structure. The galaxy, NGC1365, is one of the most-studied barred spiral galaxies. It is sometimes called the GreatBarred Spiral Galaxy because of its strikingly perfect form. ? Barredgalaxies like NGC 1365 are actually quite common, scientists said. According torecent estimates, two thirds of spiral galaxies are barred, and recentobservations have contributed evidence of a barin the Milky Way. 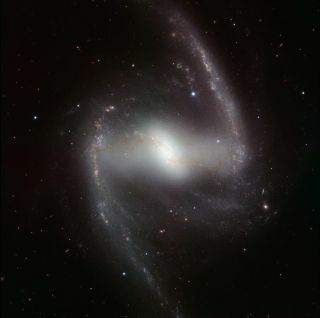 Astronomershave used NGC 1365 to study how spiral galaxies form and evolve. By examiningthe complex flow of material within the galaxy, researchers can pinpoint howthese processes affect the reservoirs of gas from which new stars can form. The galaxy NGC1365 has a straight bar packed with stars at its center, with two visible outerspiral arms. The entire galaxy is laced with delicate dust lanes, and close tothe center is also a second spiral structure. The newimage of the galaxy was taken with the powerful HAWK-I camera on ESO's VeryLarge Telescope at the Paranal Observatory in Chile. It was captured ininfrared light, which cuts through the dust that obscures parts of the galaxywhen viewed in visible light. The photo revealsa clear glow from the vast number of stars that are located in both the bar andspiral arms. NGC 1365 islocated within the constellation of Fornax (the Furnace). The entire galaxy,including its two huge outer spiral arms, spans approximately 200,000light-years wide. One light year is the distance light travels in one year,or about 6 trillion miles (9.7 trillion km). The huge bar structure within NGC 1365 disturbs the shape of the galaxy's gravitationalfield, which causes regions of gas to compress and trigger star formation. Manyhuge young star clusters trace out the main spiral arms and each containsanywhere from hundreds to thousands of bright young stars that are less than 10million years old. In thephoto, most of the tiny clumps that are visible are actually star clusters, butthe galaxy is too remote for single tars to be seen individually. The galaxy'sbar consists primarily of older stars long past their prime, but many new starsare born in the stellar nurseries of gas and dust in the inner spiral close tothe nucleus. The bar alsofunnels gas and dust gravitationally to the very center of the galaxy, whereastronomers have found evidence to support the presence of a supermassive black hole, well hidden among myriads ofintensely bright new stars.